Were you looking for The B-side? It’s here but…revamped. After much consideration, I’ve decide to combine The B-Side into my Think & Grow Chick Accountability Group. With the recent growth of the Accountability Group (as of this post we have nearly 1,000 members!) and the fact that we post our goals in there as well, I felt like it just made sense to combine the groups. Also, as I’ve continued to do these B-Side post, I’ve realized more and more that my business goals are inter-related with my personal goals. 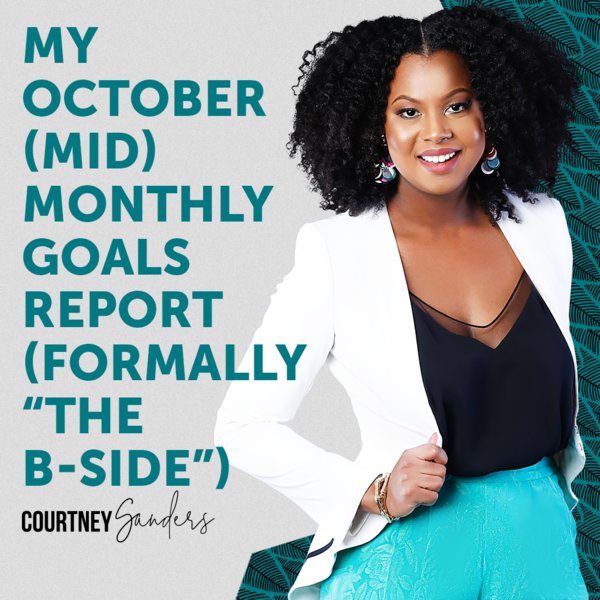 I was starting to feel kinda stifled only reporting on my business goals, so now these “Monthly Goals Reports” will reflect both my personal and business related goals! …then post your goals either in the group, in the comments to this post below, or in a dedicated post on your own blog, if you have one. 1. Focus on getting new clients. Eh, yes and no. As you can tell my the new look of the website, ya girl has been majorly busy. Shortly after I posted my September Monthly Goals Post, I decided to go really hard and elevate my brand (more on that below). So I shifted my focus from finding new clients to making sure my brand was rock solid first. Just two weeks ago, I launched the #OverHereBeingDisciplined challenge with Myleik Teele (Curlbox CEO) which brought my a FLOOD of new followers. This was a top secret project I was working on with Myleik for several weeks but I new it would be huge once we launched it. Thus, I felt it was really important to make a great first impression with all the new people who would be checking me out that weren’t familiar with me. This strategy worked! While my focus wasn’t on getting new clients, I ended up getting a lot of interest into my coaching, speaking, and other products. Just goes to show you the power of making sure your business “house is in order” before trying to attract new clients. 2. Finish my first Kindle book. Womp, womp, womp. Well, not a total “womp!” All the content for my first Kindle book is pretty much done, it just needs to be edited and formatted into a proper manuscript. I already know I won’t have time to work on that the rest of this month (see below) but I want to get back on this in November. 3. Create content for my next paid program. I knocked this one out the park! (If I do say so myself…) After the major success of both of my prior self-discipline challenges, plus the recent #OverHereBeingDisciplined challenge I just finished with Myleik (if you missed it, make sure you’re on my email list as members of my community are ALWAYS the first to know…), I knew I wanted to create something to help women maintain strong self-discipline going forward. All these challenges are great but they don’t really give me the opportunity to go deep and really teach. Self-discipline is so much more than willpower – your time management, internal self-talk, and overall personal development really needs to be on point if you want to succeed. 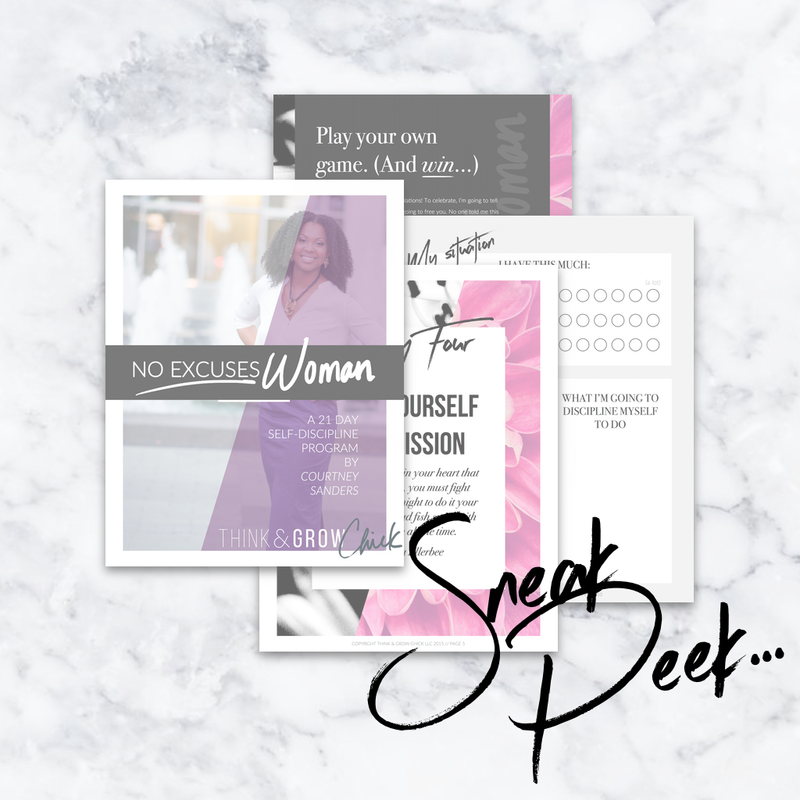 So, to help all my fellow Think & Grow Chicks out, I created No Excuses Woman, which goes live November 1. To say I’m excited about it is an understatement! Stay tuned (again, make sure you’re on my email list!) as I’ll be rolling that out soon. 4. Find 3 outfits for new photo shoot. 1. Finish No Excuses Woman Program. As I said above, No Excuses Woman goes live November 1! I still have a lot of technical stuff to work out for it – I’m considering creating a membership site – so my top goal for the reminder of this month is to get all that worked out. 3. “Batch” create a bunch of new blog content. While I was pretty active on social media last month, I didn’t post any new blog content. Part of that was because I couldn’t – while my developer was designing my site, I couldn’t make any website changes. But even after he was done, I jumped straight into the #OverHereBeingDisciplined challenge which took most of my time, so I didn’t post anything new. My goal for the rest of this month is to pick a day or two and just bang out new content for the blog. Expect new podcasts soon! 4. Get fitness and diet back on track. Yeah, I’ve been slacking here, especially on the diet. My workouts have gotten really haphazard as I’ve been using my daily gym time to work on business stuff. For the rest of this month, I want to go back to honoring that time and using it strictly for workouts. I’ve also been researching different diets in an effort to feel more healthy and feminine (Feminine?!?! Yep, see below…) and I want to explore an Alkaline diet. I’m looking into it but my goal for the rest of this month is to focus my daily eating on fruits, vegetables, and a moderate amount of grains. Re-writing my goals everyday. This has been a game changer for me. So much so that I’m going to do a post/Periscope about this soon. I find that when I write my goals down before my to-do list, the things I write on my to-do list changes. It’s like re-writing my goals reminds me of what really important and what’s not. I used to be super busy doing everything but now I find I have more clarity around doing the right things. This is literally how I was able to get a new website, new photoshoot, and a new paid program done. Rewriting my goals daily paved the way.